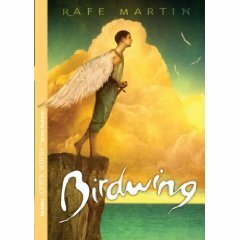 Birdwing by Rafe Martin is the story of a strange boy with one arm, and one wing in the place of his left arm. It is an extension of “The Six Swans”, the Brothers Grimm fairytale, which has a seemingly unfinished end with a small boy being left with a swan wing in the place of his left hand. Taking off from this end, Rafe Martin lets his best wing – his imagination – fly fertile on the characterization of the winged boy and his life. Ardwin, the winged protagonist, learns to live with one arm as if he were an invalid. And the wing is not a lame, dead organ, but a living wing that sends intuitions and signals of entrapment, and nurses an urge to fly and dreams of returning to the sky. Enduring years of insults and frustration, Ardwin, now a young man finds himself neither a complete human, nor a complete bird, with only one wing, that cannot fly. The writer has beautifully presented the protagonist’s dilemma on being torn between wanting to live as a human and seething to fly as a bird and the agony of not belonging to either of the species. Rafe Martin dedicates the book as, ‘For the wing we each have’. The wing represents each of our uniqueness, the inner voices, heartfelt dreams and something different in each of us in spite of belonging to one form of species. The hand represents the established codes and norms of a society, the uniformity and conformity expected from the individuals in the group. It also becomes evident that this kind of unwritten norms for belonging to a group is not propriety of human world alone, but natural requirements for belonging to any pack or herd. So what happens to that deep seated personal freedom we are born with, the uniqueness we possess which shows up so blatantly when the community urges to downplay the diversity for the sake of the whole? What does Ardwin do with his wing? Does he have a choice that springs from one’s own personal freedom and individualistic determination? Is that choice strong enough to overcome the pull of the collective? Birdwing has all the ingredients of a fairytale – princes, princesses, witches, curses. But the case the story presents, the desperation and dilemma depicted, the sense of personal choice portrayed, these are not just of the fairytale protagonist alone, but are the eternally true dilemmas faced by the civilization. Also, this story with a whole lot of characters involving the variety of species on earth, along with some element of supernaturalism, seems to be providing a subtle indication of the universal consciousness at the cross roads. The spelling of ARDWIN reminded me of DARWIN. Also, in the course of the story, one gets a reminder of the evolutionary hypothesis, with ample insights on the similarity of the human and the non human world, the individual and collective behavior patterns. Some light is also thrown on one of the Darwin’s important concept of varieties within the species when Ardwin pondersabout the variations in the attitudes and thought process within the human species. Going a little deeper on this varieties within the species, the storyline also points that, in spite of attitudinal and instinctual variations within one set of species, there are chances that individuals of a particular species can have a sort of similarity in attitude and thought process with a member of another species. Ardwin gets a hint of it from talking horses, talking swans and emoting bears. What is that thread of similarity called? Can we name it Consciousness? Doesn’t that take it a step above Darwin? Moreover unlike any old fairytale, the writer gives a new meaning to the act and character of Ardwin’s enchanted step-mother. She is called Evron, meaning never ending, The Ever One. Calling herself the Lady of Wild Things, she says that Ardwin was her experiment, and she had always watched over him, his progress and dilemmas, unlike the usual witches of fairy tales. Evron tells Ardwin that he represents something between the old and the new. May be it is not the physical old and new. 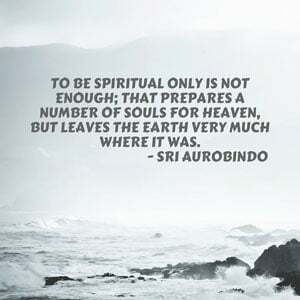 It could be, as Sri Aurobindo says, “from a materialized mentality to an idealized & illuminated life, body and mind…”*. If Ardwin’s hand represents the materialized mentality and his wing the idealized, does his integrated personality at the end indicate towards an illuminated life with a universal consciousness?